About seven weeks ago, when it seemed like this trip might actually happen, I started making lots of lists. 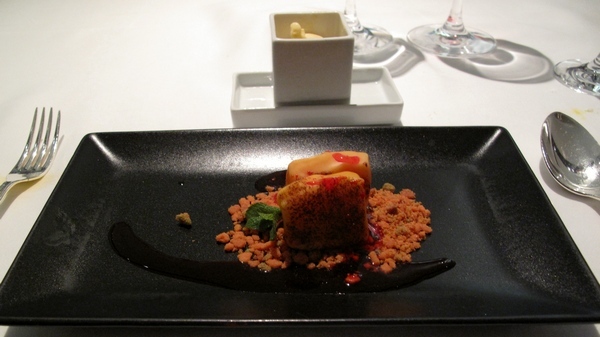 At the top of my restaurant list was Arzak. Last year I had gone to see a panel discussion with Jose Andres, Ferran Adria, and Juan Marie Arzak at the SLS Hotel in Beverly Hills. The comraderie between those three is amazing, and chef Arzak might be the eldest of the three, but he is no shrinking violet. He's feisty and opinionated, and he really won me over. Additionally, I've seen the Bourdain episode in Spain where they go to the pintxo bar and chef Arzak and his daughter Elena (NOT pronounced Elenya, by the way) are in the mix, throwing down the pintxos and txakoli with gusto, then going to the restaurant and making beautiful food. I sent them a short email explaining my situation, and if they had any spots during any part of my stay, I would take it and plan the rest of my trip around that. Which is exactly what happened. The restaurant is just a short cab ride from Donostia center where I was staying. It's its own building, in what seems to be mostly residential. My reservation was at 8:45pm, which is considered early here. As I enter the foyer, Chef Elena is talking to the hostess about the reservations for the night. I give my name and say, "Hola, Chef." She says, "Ah, you are the chef from Los Angeles. Welcome! Please come with me." I'm still uncomfortable with the title chef in refering to myself, even though I suppose it does apply to me. But hey, when chef Elena is willing to use it, I'll take it! She leads me directly into the kitchen, where there is an army of people in whites, all buzzing around, getting ready for dinner service. Thirty chefs and cooks in the kitchen. Later I would find out that they are serving 27 guests that night. Granted, probably at least half of the cooks are probably unpaid stagaires (kitchen interns/apprentices), but that's still more than one cook per guest, and certainly the front of house makes it at least 1.5 employees per guest. People tradeoff getting paid for learning and being able to put a prestigious name like Arzak on their resume. Having that many people in the kitchen makes teamwork, timing, and communication that much more important. This is normal for them, they are 3 star Michelin, and so everything must always be of the highest standards. She explained that chef Juan Marie was away that night, at a conference or something. As if she needed to explain to me why he wasn't there to cook for me. She is an elegant woman, and seems very genuine. She pointed out a few things about how the kitchen runs, and her husband was having dinner at the chef's table in the kitchen. Then, I was led to the dining room - a modern space, with textures of concrete, wood, steel, linen, and panels of light. There's a column in the middle of the room which functions as their server station and jackstand. Probably the most they could seat in this room is about 36, but tonight it's set for exactly the number they have on the book. There's also a private dining room upstairs where they can accomodate about 25. The lighting was well designed to light the tables without glare, which made for easy picture taking without flash (the camera I'm borrowing from Matt and Tara does a great job without flash anyway). The customers are surprisingly casually dressed. A few suits, a few sport coats, including myself, but the rest dressy casual. One actually in stylish athletic gear with a turtleneck. 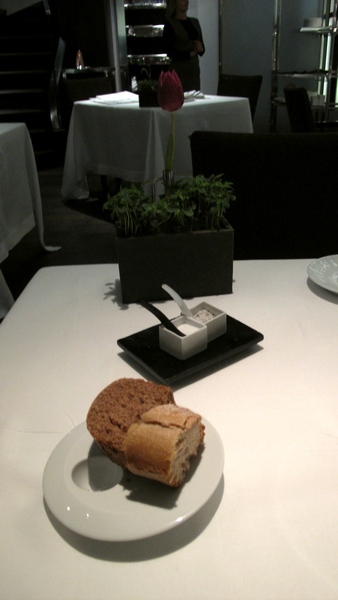 This is the bread, salts, and flower on the table. The captain was very friendly and helped me with my selections. 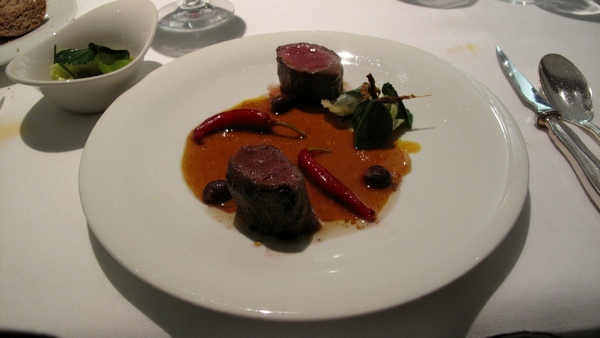 Although I was getting the tasting menu, at Arzak you must choose between two dishes for the later courses, for instance, wild duck versus venison. Should anyone visit, I suggest you plan to go with at least one other person who can get the other items, and you switch plates midway, to try more items. I also wanted to add a foie gras course, which he seemed surprised by, but it's not unheard of when there's not one already on a tasting menu. I started with a glass of cava(Spanish sparkling wine), and all the amuse bouches arrive at the same time, which makes for a nice pace in the whole meal I think. 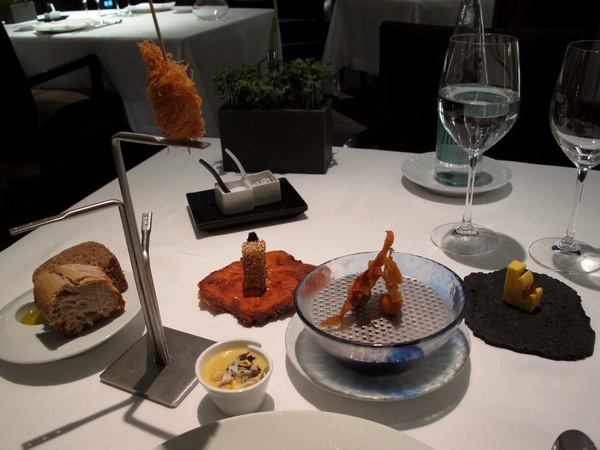 If five little one biters arrive one at a time, there might be an extra lag between one or the other and it makes the meal take substantially longer.. From left to right, on the stand, a pintxo with cod wrapped by extra fine kataifi, a little corn soup with truffle, toward the background a rectangle of potato covered in puffed amaranth on an edible red bell pepper cracker "plate", a gooseberry with potato chips to mimic the gooseberry covering, and a cutout of a goat cheese and turmeric "pate". I don't have the menu with me (it's in a box that I mailed home) so I'll add more detail later. If you can't see the goat cheese on the black slate, right click and open the picture in it's own tab. The gooseberry is on that little rack because there was dry ice under there, and they poured hot water on it at the table to get the "smoke" effect. This is my favorite course. Underneath is Iberico ham and a variety of citrus supremes (in season now). At the table, they add 2 oysters with shredded konbu seaweed. One of my favorite things in the world is ponzu sauce, which is dashi (Japanese broth with smoked bonito), konbu seaweed, yuzu, and soy. So this is kind of in the same universe - citrus, seaweed and seafood. The liquid is also poured at the table, it's ginger water. There are so many Japanese flavors here, clearly it is their style using Japanese combinations. Incidentally, the waitstaff are all in black, but with a gray apron that seems to be based off a Japanese apron. Kind of retro-futuristic. Jamon Iberico is omnipresent in Spain, but for the most part it is not paired with many things. Either a plain plate of jamon, or in a simple sandwich, or maybe crisped up. But I've always thought that some Spanish hams have a funky marine/oceany/umami quality to them. 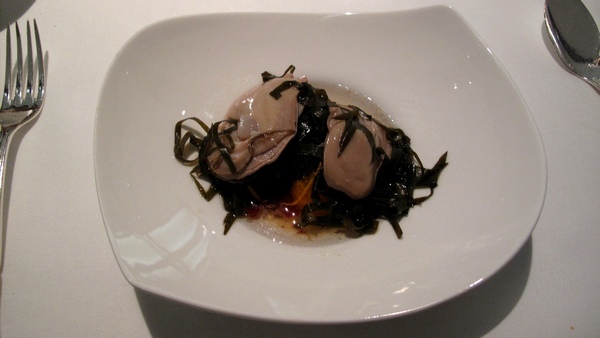 Another aspect that reinforces umami is the use of sweet and savory, and there are sweet elements from the citrus, konbu and ginger water, and savory from the Iberico and oysters. 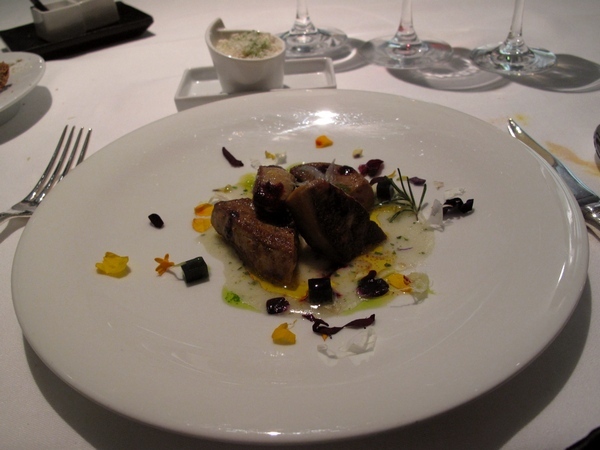 This dish had many layered flavors, with contrasts of acidity and freshness. Just fantastic. I had a glass of white wine, but the name is in my notes. 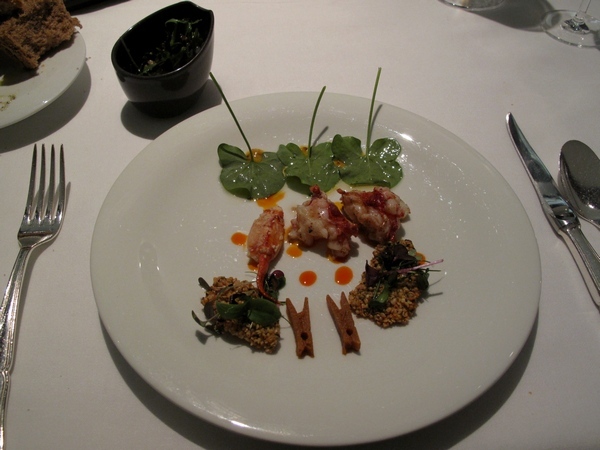 In the middle are three chunks of a small lobster, the two clothespin shapes are like cake or bread made with the cooking liquids and tomalley, to either side are crisp breads coated in hemp seeds and toasted, and across the top are some greens with a whole grain mustard vinaigrette. The upper left is a "sidecar" of extra microgreens salad, tapioca pearls, and the whole grain mustard vinaigrette. I think this is so they don't have to find a spot on an already busy plate for a pile of herb salad. The lobster had a very concentrated, specifically lobster flavor. Maybe poached or cooked sous vide with lobster stock. Hemp seeds have a nice texture and nuttiness to them. Excellent. 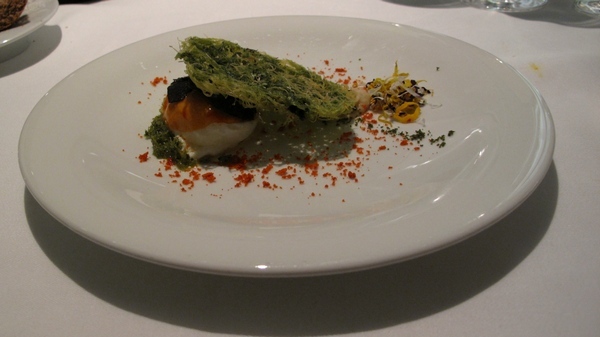 This is a slow poached egg, finished on the plancha (griddle), with a film of tomato (I think they make a sauce of tomato, and mix it with a gelling agent - then when they apply it to the egg it sticks rather than slides off), a wafer of kataifi flavored with herbs. I don't recall what that dark item is. Oh, there should have been a mussel here on the right, but I can't eat mussels these days, so they just omitted it. The red is breadcrumbs with Spanish paprika, and some edible flowers. I like that the white was firm - a lot of times when they do these slow cooked eggs, the white is like a mottled jelly, which is not so appealing, in my humble opinion. The wafer was a little hard to eat with knife and fork, but it was a tasty dish. There's a fish course that I'll have to insert later. I asked for a glass of tinto, which ended up being the Arzak house rioja. Excellent. Nice pairing with the venison tenderloin, hot chilies, red wine sauce, beans, and tiny lettuce salad. Very nicely cooked venison. It's hard to tell here, but the dark green leaves in the salad (spinach?) were individually punched out in circles, to match the tiny lettuce leaves. The chilies weren't so hot, but even for as much paprika as the Spainards use, their heat tolerance is very low. Their motto is usually "Sabroso, pero no picante" - Flavorful, but not spicy hot. I was well on the way to being full here. Foie gras. I don't recall the components at this moment. In the sidecar is shaved walnuts, almonds, and crushed chicharron (crispy pork rinds) as garnish for the foie gras. I thought it would be a tasting portion, but it's like a full course. My fault. Just too much. I left some behind. Tragedy. During the meal, chef Elena visits every table to make small talk and check that everything is going well. She's very poised. At one point, however, she came out a tiny bit flustered and said, "I have just been told your venison may not have been warm enough..." and was about to launch into apologies. But my dish was well made, and I told her so. She thanked me and went off to another table to talk about it. Damage control, I guess. 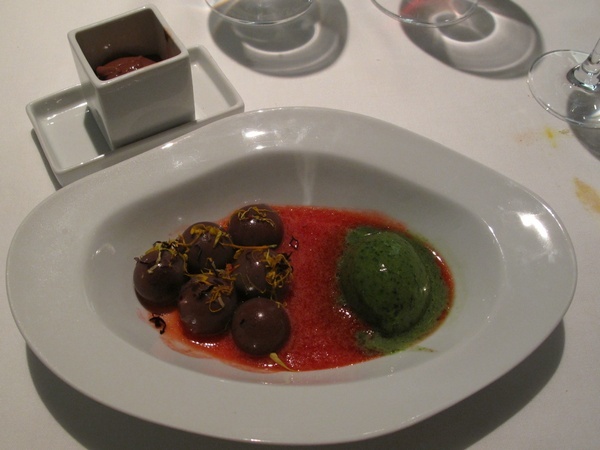 On the left, spheres of warm chocolate, strawberry sauce, and basil sorbet. Sidecar of chocolate sorbet. Excellent. So full and feeling the wine at this point. Lemon Tart. The curd has some sort of candy shell to help it stand up like that, with crumbled cookie crust, The red sauce may have been from pacharan, their sloe berry liqueur, a touch bitter. Vanilla bean ice cream. Beyond full at this point. Uncomfortable. And kinda buzzed. My own fault. Chef Elena came out again to apologize that she was saying goodnight, she had to leave early in the morning for a trip, but she hoped I enjoyed my meal. So gracious. Yes, I did enjoy my meal. I asked for the migardise (usually cookies and bonbons or something) to be wrapped up to go, and I made a somewhat unleisurely exit. Back at the pension, here they are. 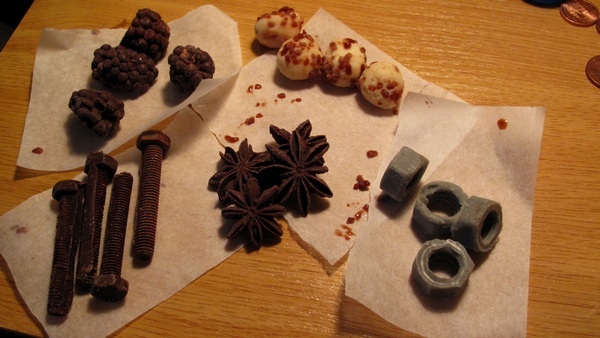 I don't really understand the nuts and bolts joke, but they're made of chocolate. The anise ones aren't particularly anise flavored. I've eaten in some very nice restaurants, but this is my first official 3 star dining experience, and it did not disappoint. They manage to be mostly serious while still being very hospitable. To me, it's clear that they deserve all their accolades and prestige. Maybe they are not on the bleeding edge anymore, maybe certain things feel a bit past the curve - but that's a young person's game. As one of the trailblazers, they have pretty much moved past gimmickry and are just using technique to make elegant, tasty food. This would be a great meal anywhere, and in a setting like Donostia/San Sebastian, it just makes it even more special. Very enjoyable and highly recommended. I'm grateful to have experienced it.